While playing with some palaeogeographic maps from Ron Blakey’s website recently I was trying to come up with some way of manipulating the maps in a fun, and really visual, manner. I found somewhere about instructions on overlaying images on the globe in Google Earth, probably meant more as a way to place smaller regional maps on the globe. However, I realised that you can overlay a new image across the entire globe as well. What this means is that I could take a palaeogeographic reconstruction and manipulate it in 3D much as I would the modern geography in Google Earth. The picture on the left gives you an idea of what it looks like. The whole process is pretty simple too. Download an image for whichever time period you like (make sure the map is straight up lat/long, and not a Mollweide projection). Then, open up Google Earth and select Add > Image Overlay and select the image you just downloaded. You probably need to tweak the placement a bit though, so under the Location tab in the Image Overlay window, be sure that you set the boundaries to 90 degrees North and South and 180 degrees East and West, and hit OK. Once you’ve done that, you can spin the globe around and take a look at how the Earth once appeared. One neat thing too is that you can adjust the transparency of the image overlay by using the slider just above the Layers on the left hand side. Have fun! 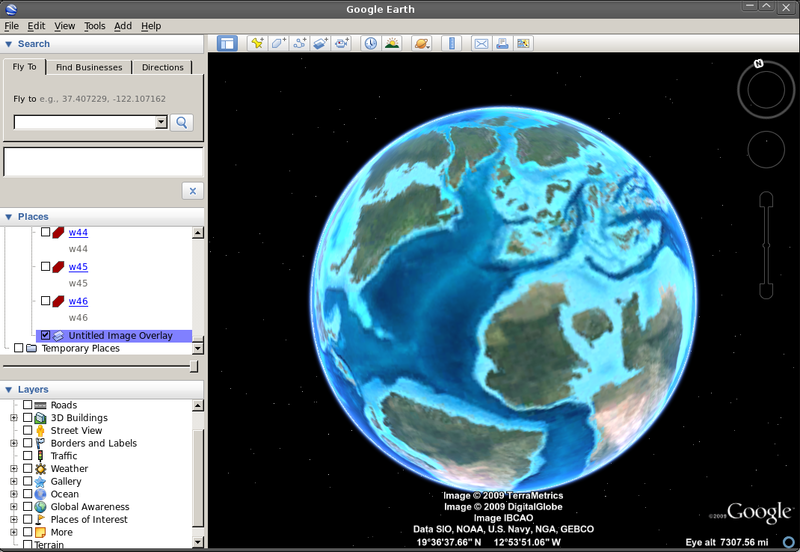 This entry was posted in Uncategorized and tagged gis, googleearth, palaeogeography. Bookmark the permalink.